Although I am happily living in my van, some people are not quite as fortunate. Recently a friend of mine found himself homeless. Since my relatives have property, they let him stay on it but just have no room in their home. So I gave him my tent for now, but with winter coming on he will need warmer shelter. We are in the Appalachian mountains. He insists on doing most of the work himself, but wanted me to go ahead and document it as we go along so it might help others out there. We are trying to do it as cheaply as possible and quickly. Please bear this in mind as you follow this build. It might not be the right way to do something, actually it probably wont be, but it will be the cheapest and easiest way we could figure out. It might not even be perfectly square or level. Shelter is the primary objective here. The idea is to make the shelter a little over 6 ft wide, and 12 ft long, and 7-8ft tall. It will have a pitched roof, since one side will have walls that are about a foot lower. The plan so far for the roof will be inexpensive osb, covered with something (undetermined). Insulation and exterior sheathing as of this posting are also up in the air as we explore options. 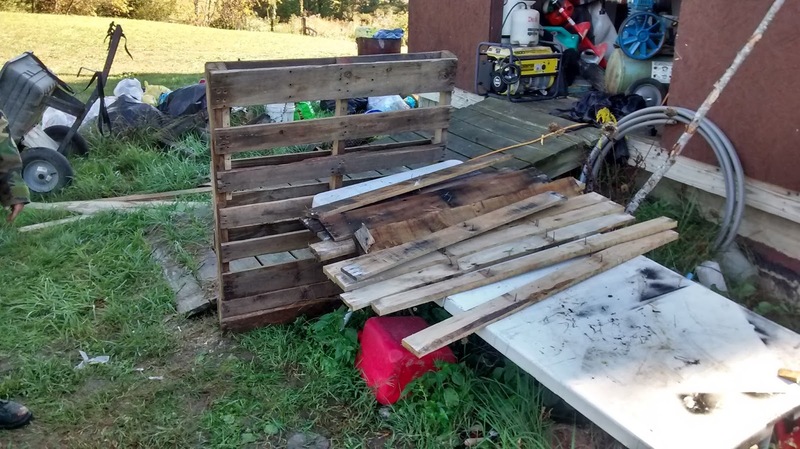 Most pallets are a little over 3 ft by 4ft. So that means you will need 26 whole pallets for the floor and wall framework. 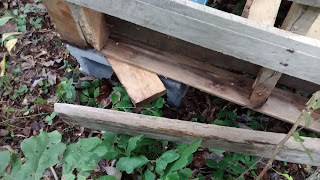 Since we have more time than we do money for lumber, we'll also have to break down many more pallets for lumber as well, particularly extracting the 2x4s that provide the main support of the pallets. 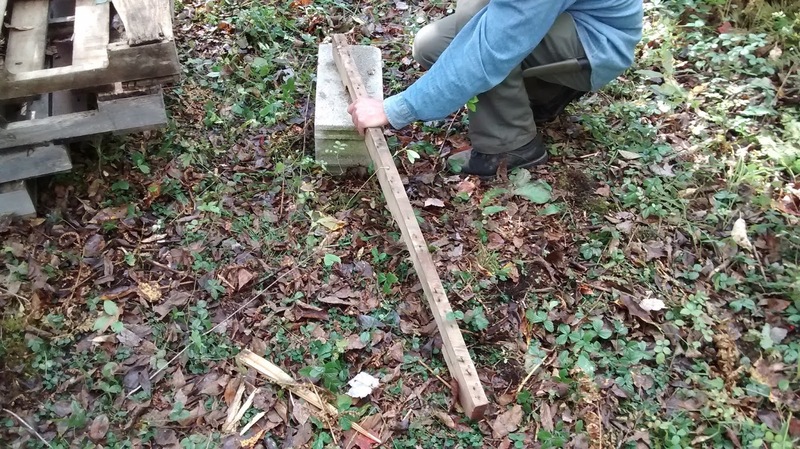 Since fine woodworking isnt the goal, we break the pallets down by using a sawzall to slice the nails off. If smaller pieces are needed, or can be used, we opted for just cutting them away from the 2x4s. We tried prying, but it is too slow and laborious unless you have a special tool for the job. 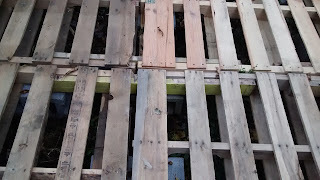 Note the added yellow board used to connect the pallets. Although we aren't being precise, the tiny home floor needs to be reasonably level. Since the terrain is not flat, cinderblocks were used to give the floor a steady leveled base. 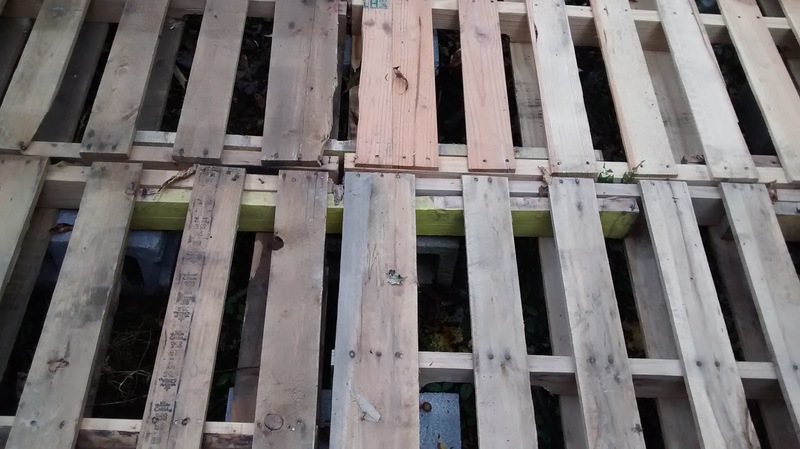 The floor is comprised of 6 pallets laid on top of the blocks, then joined together using harvested 2x4, hammered into place and then nailed. 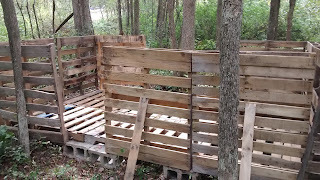 Once that is done, nail more pallets on the outside for the lower walls. We left a gap for the door to be framed in later. Well do the same for windows when the upper portion of the wall is added. Nail the sides together, and to the floor. 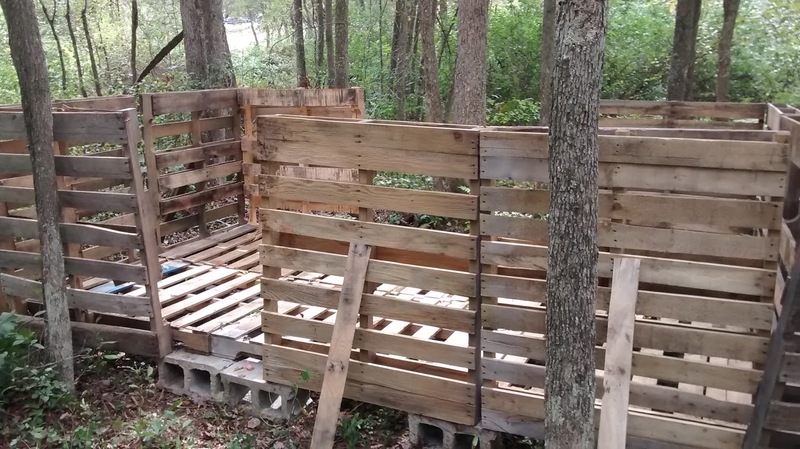 Seal up the wall pallets on the end ahead of time! Thats all for Part 1 of creating a pallet home, the next part will be up soon and well add the upper section to the walls.. I'm working on a Vanholio post about overwintering in a greenhouse with your van (coming soon). But one of the source articles I looked at might help your buddy: http://www.instructables.com/id/Live-in-a-Greenhouse/. Also, look at adding a reflective side, viz. 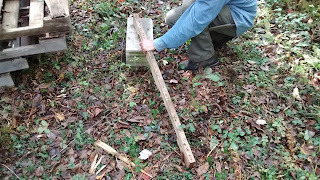 http://www.survivalgearauthority.com/2-warmest-survival-shelters-anyone-can-easily-make-pictures/.